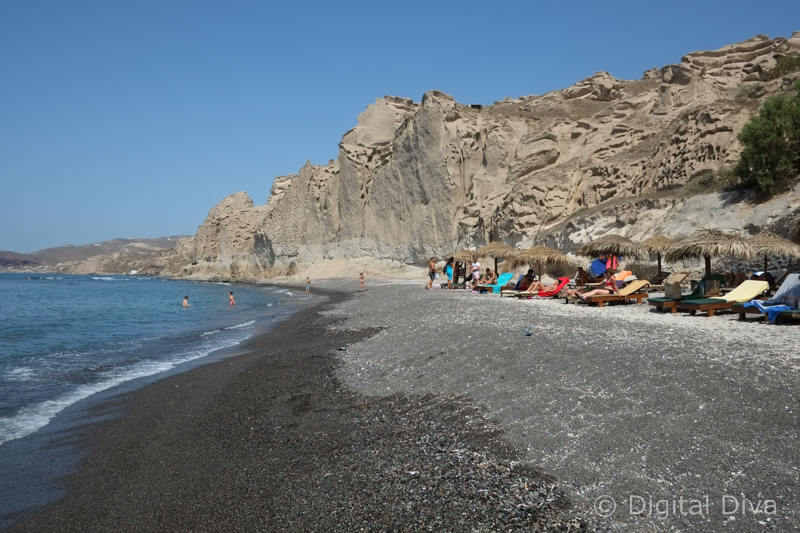 We had a lovely holiday in Santorini a month or so back, so I thought I’d let you know what I think are the best things to do in Santorini….just in case it inspires you to book a holiday there or if you’ve already booked and are researching the best things to do in Santorini. Eros Wave Bar is is lovely bar/restaurant with its own little pebble beach. The bar has a very relaxed vibe and perfect for spending the whole day lazing around there. If you want a sunbed, you need to get there before around 10:30am. You can book sunbeds for the next day (or any other future day on your holiday) at the bar. It’s €10 + €20 spend on drinks/food. The waiters who come to serve you drinks at your sunbed are really lovely. The bottles of beer are expensive (€6-7) and the vodka is even more €9 + mixer. However, a glass of sparking wine is relatively cheap at 6€. The sea is nice and warm but it’s worth noting that the pebbles on the beach are mixed with volcanic sand will hurt your feet if you’re a bit sensitive like me! There’s a little cave with beds to get massages from Costos and Anastasia. Costos gives some of the best massages I’ve ever had. 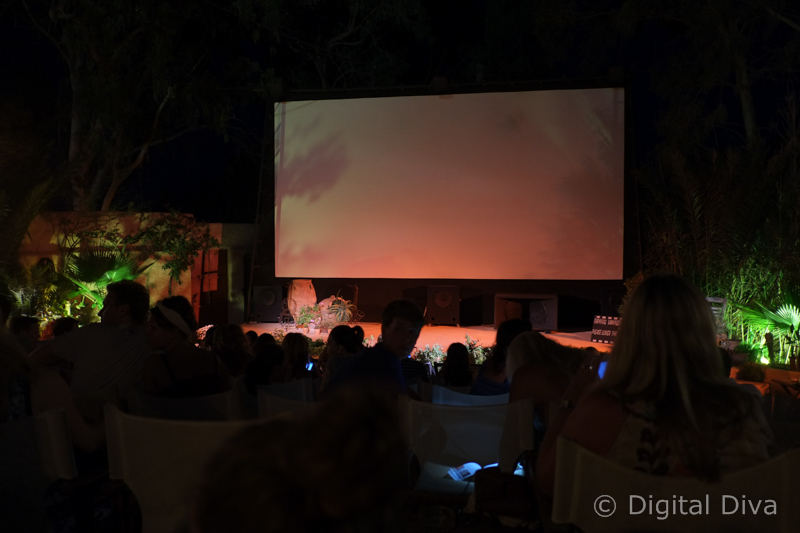 The open air cinema near Kamari is a lovely little place with a great big screen and a good 7.1 sound system…it most definitely qualifies as one of the best things to do in Santorini, however you need to take mosquito cream! 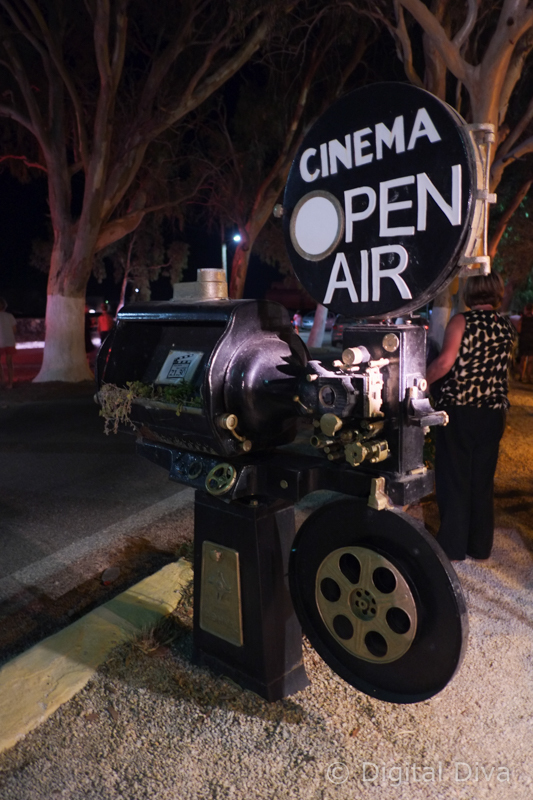 Film listings are on the website and the film starts each night at 9:30pm, but I’d recommend getting there at around 8:30pm to get the best seats. They have a full bar and snacks like ice-cream and popcorn, so sit and relax before the film starts. Eating in Santorini can be a bit hit or miss. Everywhere pretty much does traditional Greek dishes and some are great, but some are also mediocre at best. We did find some really lovely restaurants on the island, thanks to some heavy duty Trip Advisor and blog research before-hand. 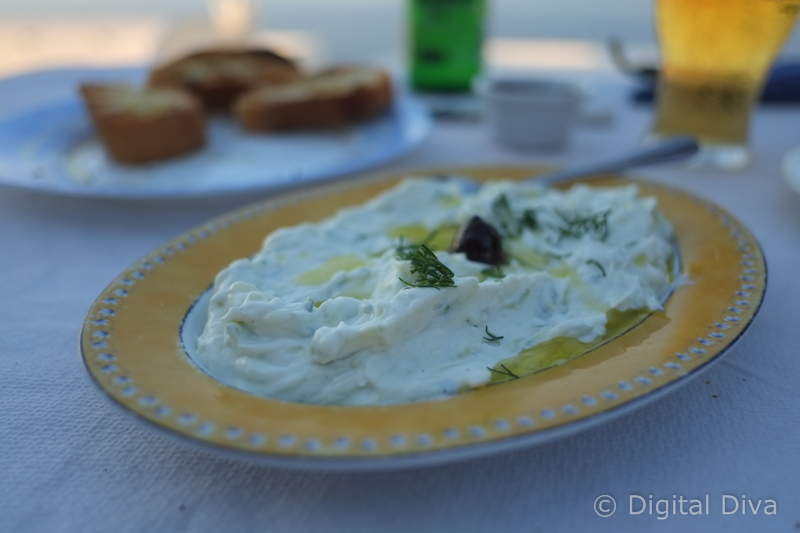 Most of the meals I went for consisted of tasty chicken kebabs and various dips such as tzatziki. 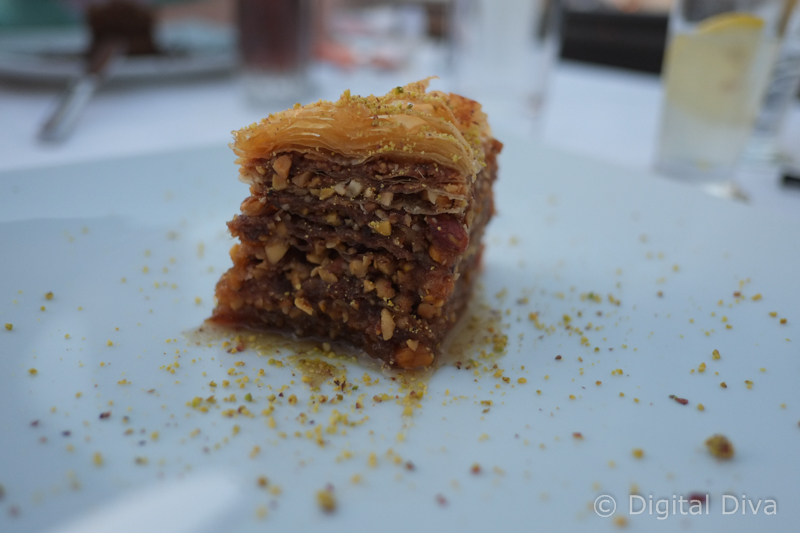 Baklava, when it’s good, is just the best thing in the world to end a meal on. It’s definitely worth checking out Trip Advisor and be warned that some of the best restaurants do charge quite a bit. Some of the mediocre ones do too, just because they have amazing views. Research, then make sure you book a table by telephone (most restaurants get busy, especially around sunset and after). 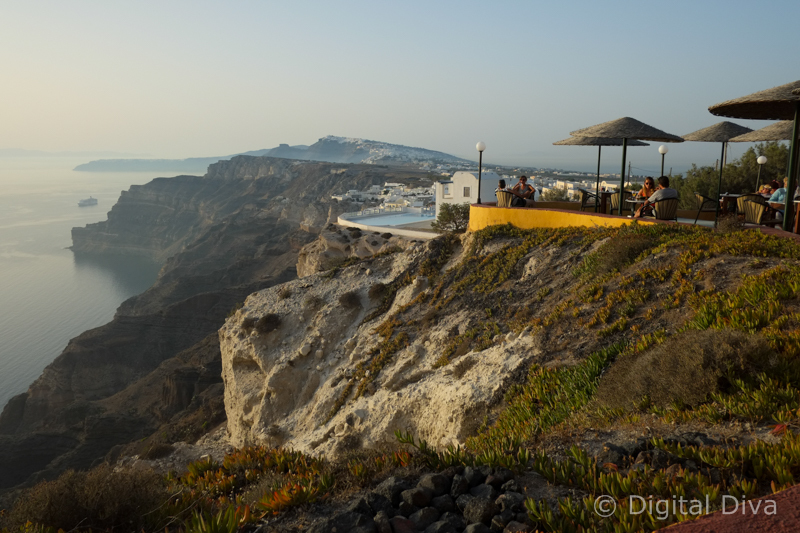 One restaurant in Santorini with the most incredible views is Senor Zorba. It’s a tex-mex restaurant and don’t let the ‘all you can eat ribs’ sign outside put you off….the food is good, not amazing…just good. What you are really going for is the view. When you book, ask for a sunset view table and you’ll be seated right at the edge of the cliff. 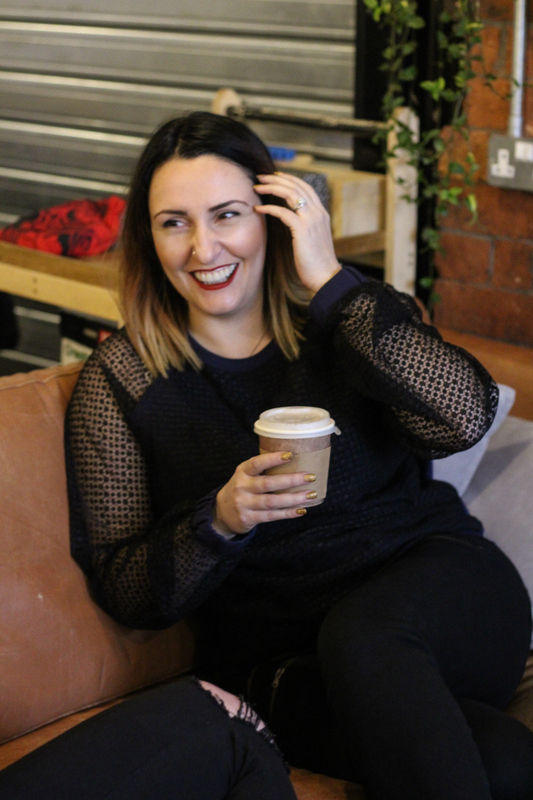 I’m not going to lie, when we first sat down I had to have words with myself….you are literally sat on the edge of the cliff and I’m pretty scared of heights. I’m glad I managed to cope with it though, it was absolutely worth it! Oia is exactly how you see Santorini on postcards. Gorgeous white-washed little buildings perched on the side of the cliff. To stay in Oia, you need to spend a good amount of money to get somewhere reasonable. The space available is small…so quite often even some of the beautiful and expensive hotels don’t have a pool. Make sure you check out the hotels fully on Trip Advisor before booking and have a look at the traveller photos to make sure you understand fully what the hotel does and doesn’t have. 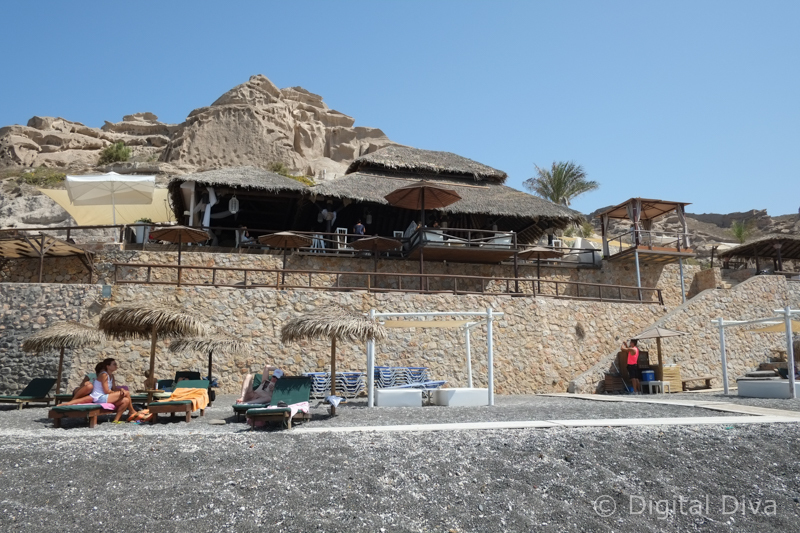 We opted to stay on the south of Santorini near Akrotiri, high on the hill. We loved it for its calmness and beautiful panoramic views. 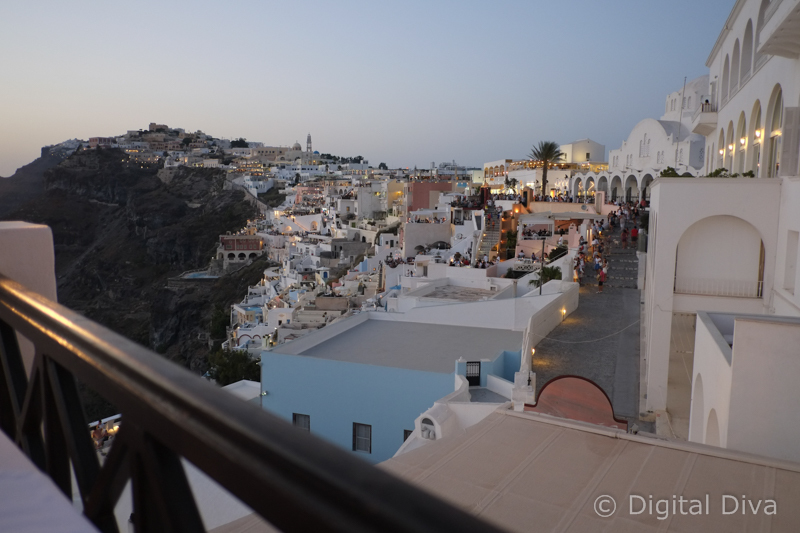 If I was to stay for the first time again in Santorini, I’d do the same…but I’d probably opt for a couple of nights somewhere expensive in Oia. You get the best of both worlds then. 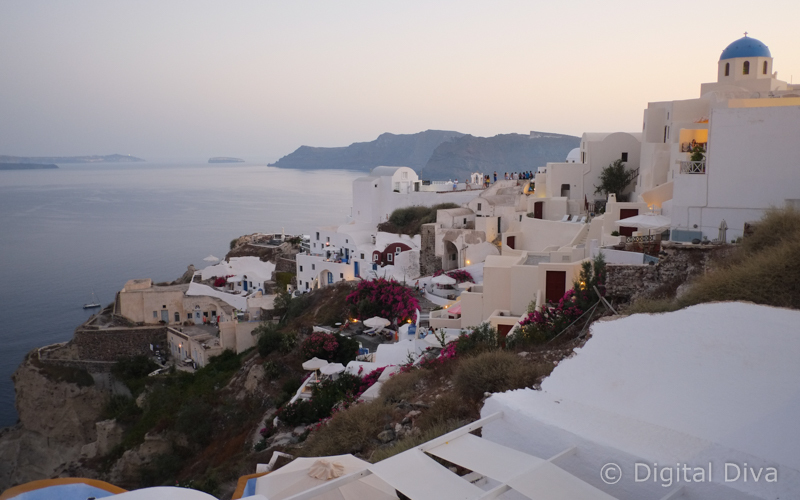 I don’t think I could do a full week in Oia, I’d feel too trapped and too much of a step away from all the good stuff in the south…but there’s no doubt it’s a gorgeous place, well worthy of spending a few days. The view of the volcano from Oia is a good one and you will have lots of photo opportunities. 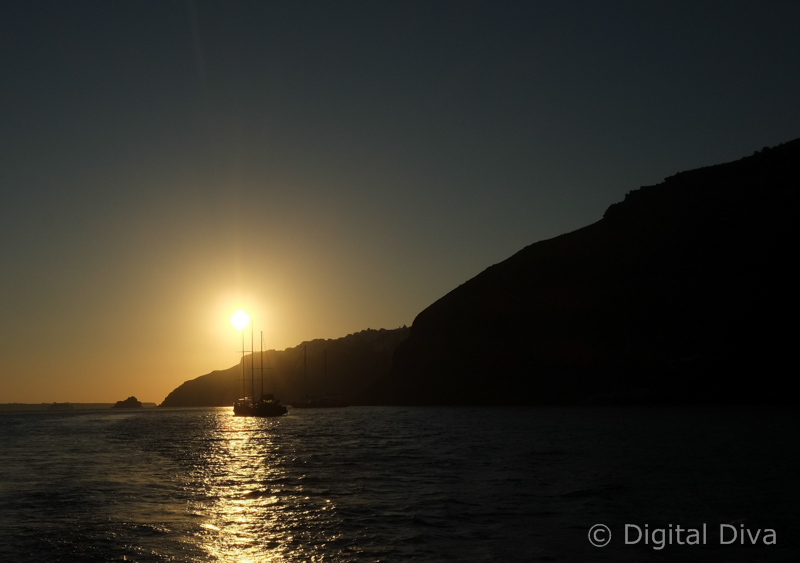 Most say it has the best sunset in Santorini, but I disagree. 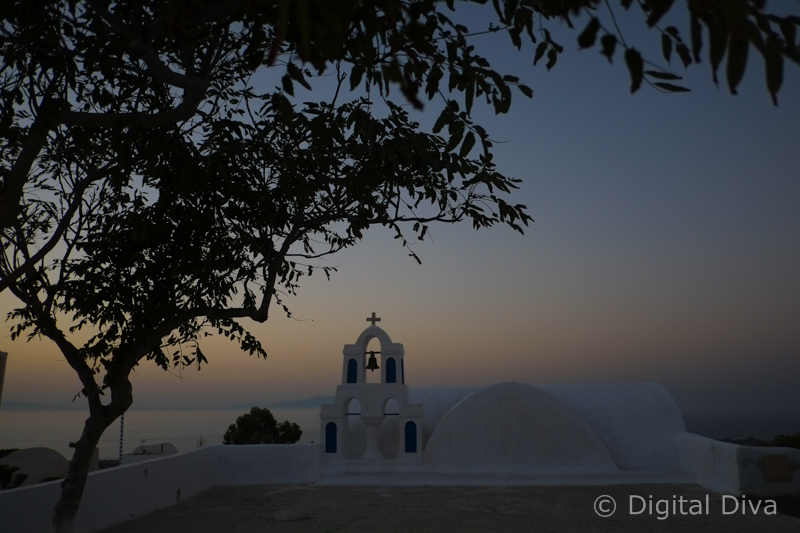 I much prefer the sunset from Fira or Senor Zorba, as it sets over the volcano. It’s worth remembering that Oia can get very busy with tourists weaving in and out of the maze of streets. Especially when the sun sets. Getting in and out by car can be a bit of a nightmare. There is one main road that’s quite narrow with quite a few coaches from the cruise ships all trying to get through. Believe me, these coach drivers do not take any prisoners! Keep out of the way unless you want to be squashed. There is a car park just off the main road which is €3 for 5hrs. This brings me into transport. The traffic is very busy in Santorini. Even at night there is no let up with cars, coaches, scooters and quads all fighting for the road. I’m very glad we opted for a small car (get one with working air con). The quads are cool but struggle with the hills and you get sun burnt. Fira is a little spoilt to be honest by the intense smell of two stroke from the scooters and quads. Fira is pretty touristy…but worth visiting. A friend stayed in a gorgeous place called the Allure Suites in Firostefani, which is on the edge of Fira (at the top of the hill in the photo below)…which I think looks like a better option for those wanting to be in the centre of the action. If you’re in Fira, make sure you stop for a cocktail at Diverso Café….they were amazing! We wanted to do the semi-private sailing (no more than 10 people on a catamaran), but it was too booked up. I’d recommend booking before you go to Santorini if you’d like to do that. I made myself feel better by reminding myself we saved €250 by going in a bigger group! 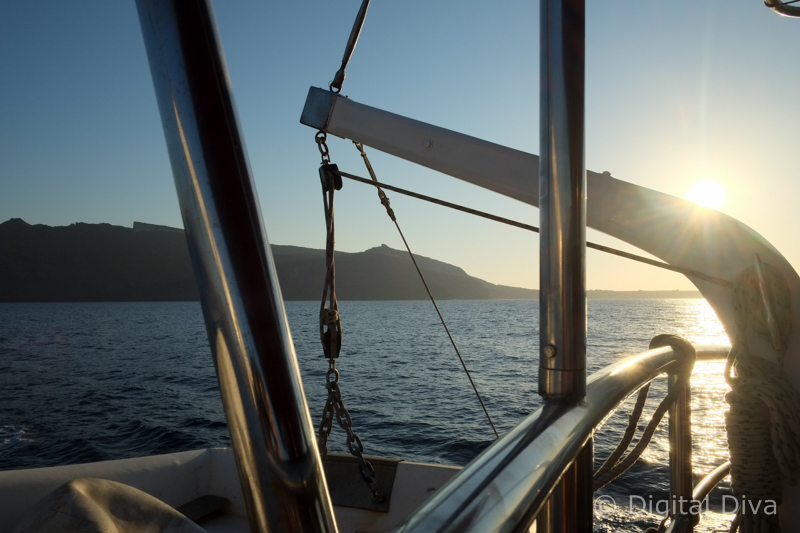 We booked with our villa and caught the boat from the old port in Fira. Our boat started off as a fairly nice one with about 30-40 of us on there. We transferred to an even nicer one part way through, which gave us all lots of room. I’m actually so glad that we didn’t manage to book the semi-private sailing, as those trips don’t let you go up the volcano. If you’d like to do this, make sure you’re wearing comfy flip-flops or even better, trainers. It’s a bit of a walk…but it was amazing to see all the craters that were created by the volcano erupting at various points in history. It kinda feels like it might if you were on the moon (weird looking rocks) and the views over the whole of the island of Santorini are just lovely. 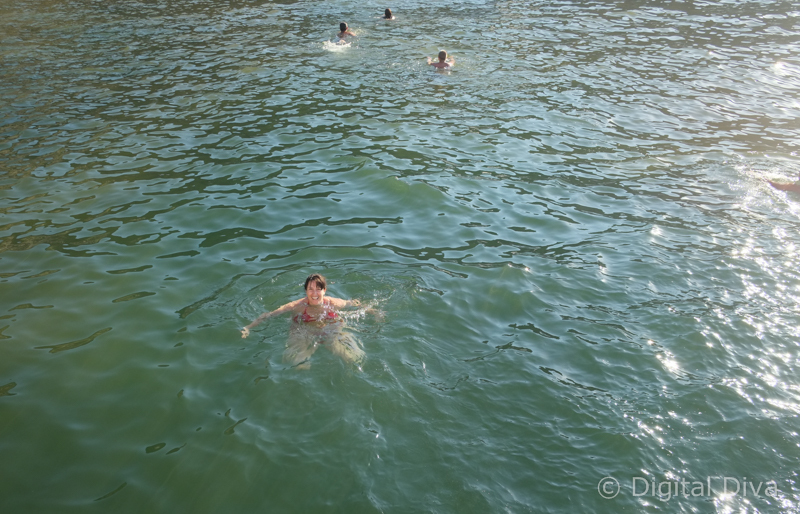 We also swam in the hot springs, which was great. One of the other people had a Go Pro, which is totally what I wished I’d had with me too! It goes without saying that the sunsets from the boat were beautiful. 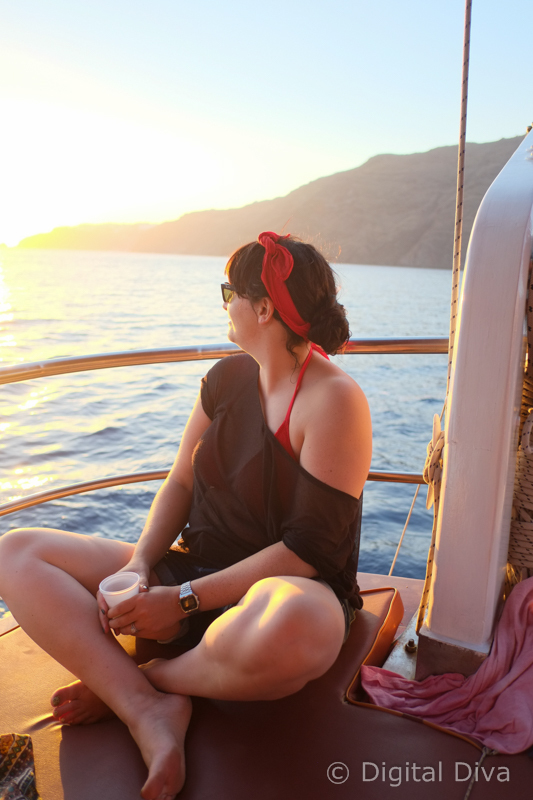 The boat trip was absolutely one of the best things to do in Santorini. It was actually probably my favourite. If you’re planning a trip, I hope this has given you a good run down of what I think are the best things to do in Santorini. We had a wonderful time! Santorini is up near the top of my list of places I’d love to visit, so your tips will be useful – I hope – one day! Great photos, especially the last one. It looks idyllic.